Proteins are often modified after they are translated, to tune their chemical properties for a particular function. For instance, proteins that must interact with other membrane-bound proteins, such as the oncogene protein ras, often have a lipid chain attached at one end. The lipid then inserts into the membrane, tethering the protein to the surface. This modification is so useful that roughly 2% of proteins in eukaryotic genomes have a distinctive CAAX motif that calls for this type of modification. This motif, found at the end of the protein chain, is a signal to the cell's machinery to perform a series of modifications, adding a lipid to cysteine, cleaving off the "AAX" portion, and capping the new exposed end with a methyl group. PSI researchers at MPSBC have recently solved the structure of a central player in this process: the enzyme that cleaves off the AAX motif. They studied the protein Ste24p from yeast, shown here from PDB entry 4il3, which was the first of these proteases to be discovered. It is found in the membrane of the endoplasmic reticulum, and is essential for the maturation of a small peptide pheromone that is used by yeast to make the proper pairings during mating. The enzyme folds into a series of alpha helices that enclose a hollow chamber that spans the membrane, with the active site sheltered inside. Researchers at the Structural Genomics Consortium solved the structure of a human homolog of Ste24p, called ZMPSTE24 (PDB entry 2ypt), which performs a similar function in processing of prenylated proteins. Problems with this ZMPSTE24 can have a severe impact on health. It is essential for the maturation of lamin proteins, which normally form a network of cables that support the nuclear membrane. Lamin is first synthesized, prenylated, and bound to the nuclear membrane. Then, in a final step, the lipid group is cleaved off and the protein is released to form the nuclear lamina. The advantage of going through this lipid-bound form is not well understood, but if the cleavage step is blocked by mutation of the protease, it leads to early-aging progeria diseases. Ste24p and ZMPSTE24 have a very unusual structure: the protein chain forms a hollow shell with the active site buried inside. 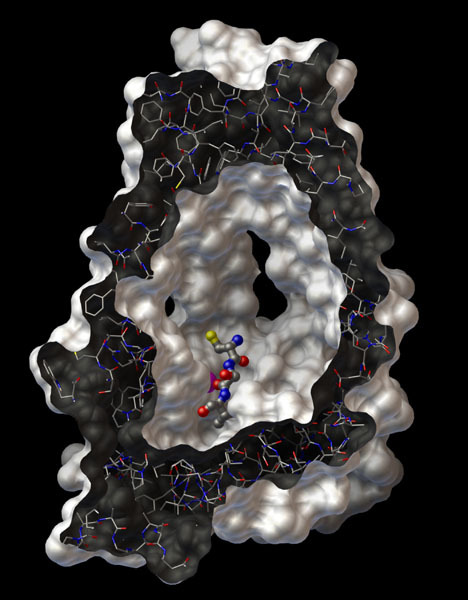 The large space inside is filled with water molecules, and the protein shell has many small gaps between the alpha helices, which presumably provide portals for protein chains to enter and exit during the processing reaction. The image here shows a cut-away view of ZMPSTE24, showing a small peptide (in ball-and-stick representation) bound in the active site at the bottom of the large cavity in the protein. Two of the portals are visible on the back wall. The active site of these enzymes, which uses a zinc ion to catalyze the cleavage reaction, is very familiar. 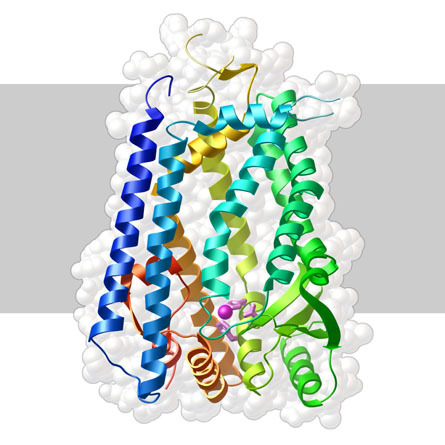 Zinc proteases are also used in many other functions, such as the digestive enzyme thermolysin, secreted by bacteria, and the site-2 protease, which is involved in the maturation of membrane-spanning proteins. Looking at structures of these enzymes, they all have very similar active sites, with a characteristic HEXXH motif that coordinates the zinc. To compare these different active sites, the JSmol tab below displays an interactive JSmol. The active site of the CAAX proteases is similar to other zinc proteases. Four examples are shown here: the CAAX proteases Ste24p and ZMPSTE24, site-2 protease, and the digestive enzyme thermolysin. Notice that all have very similar amino acids coordinating the zinc ion (magenta). You can use the button to zoom out, to see that the proteins are entirely different, in spite of their similar active sites. Pryor, E. E. et al. Structure of the integral membrane protein CAAX protease Ste24p. Science 339, 1600-1604 (2013). Quigley, A. et al. The structural basis of ZMPSTE24-dependent laminopathies. Science 339, 1604-1607 (2013). Michaelis, S. & Barrowman, J. Biogenesis of the Saccharomyces cerevisiae pheromone a-factor, from yeast mating to human disease. Microbiol. Mol. Biol. Rev. 76, 626-651 (2012). Feng, L. et al. Structure of a site-2 protease family intramembrane metalloprotease. Science 318, 1608-1612 (2007). Holmes, M. A. & Matthews, B. W. Binding of hydroxamic acid inhibitors to crystalline thermolysin suggest a pentacoordinate zinc intermediate in catalysis. Biochem. 20, 6912-6920 (1981).